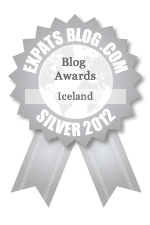 Muse, Parent, Write, Explore: These writings from Reykjavik are brought to you by Erica J. Green, a writer and editor living in Iceland. Also, here’s my disclaimer: the views on this blog are my own. They do not represent that of the Department of State or anyone else. Got it? sending you big hugs! are you gonna be in CA over the holidays? Any user may vote once until February 12 when voting ends. The blogs will be ranked according to number of votes and the winner will be announced on February 14. In order to improve your chances of winning, we recommend you spread the word through your blog, to your users, family and friends so they can vote for your blog. THANKS! This is great news. Can you send me the code again for the award/ranking. I would like to add it to my blog but couldn’t get the above to work. Much appreciated. Hey Erica! My name is Alison and I’m a casting producer for HGTV’s House Hunters International. I’m looking for American expats to feature on our show and I am hoping that you can point me in the right direction. Feel free to email me at any time.